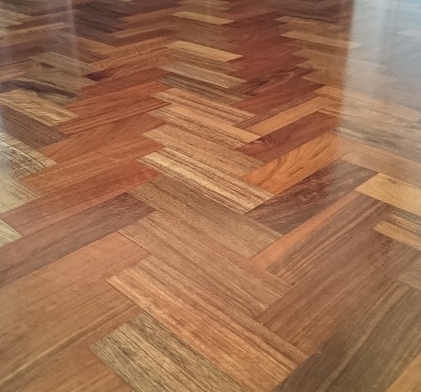 Choosing a wood floor can seem very daunting, and our team are here to help you through this process. We can give you personalised advice to help source the most suitable floor for your requirements. Please contact us for further information. To help you get started, we've given a brief description of the different options below. Hardwood trees are common to the UK and Europe, common types include Oak, Ash, Cherry, Maple and Poplar. Each type has their own unique pattern, marks, colour and appearance. Oak is by the far the most common material used in the UK market. Whichever type of wood you choose, the production processes and finishing can be adjusted to completely change the final look of your floor. 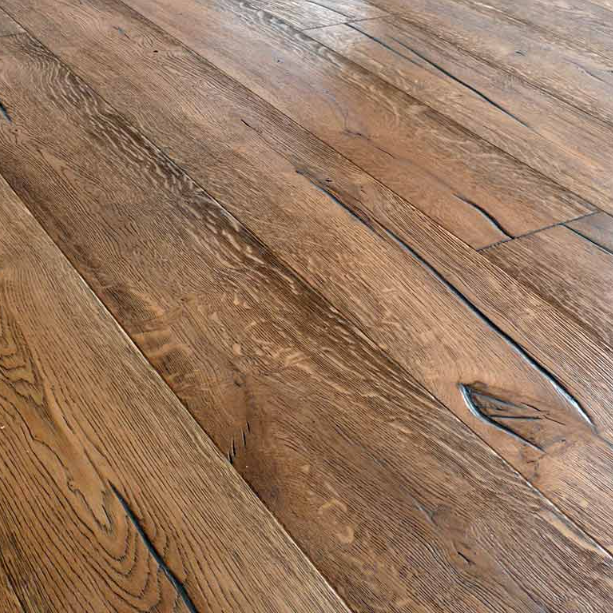 For hundreds of years, floor boards have been made with single pieces of solid wood. Our modern day production techniques has resulted in the evolution of engineered boards. These typically have cores constructed with two or three layers of wood with a top layer of solid wood. When installed, this makes engineered wood flooring both look and feel like solid wood. 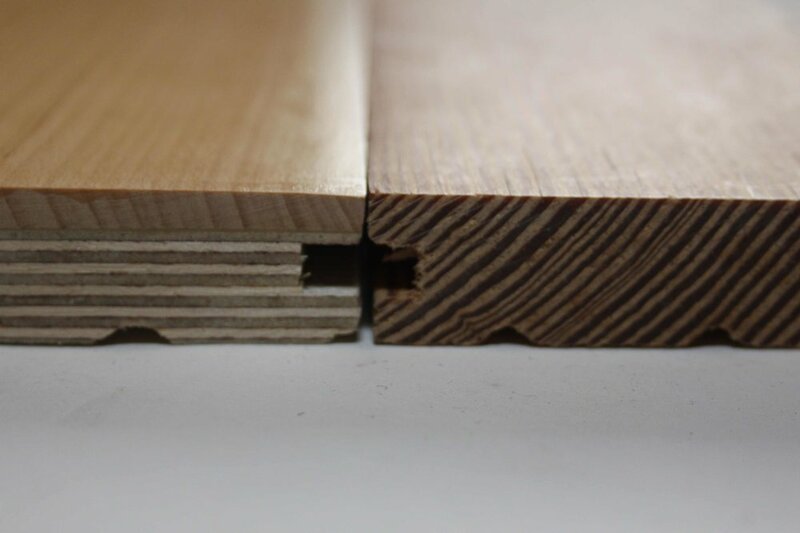 The construction engineered wood means that it is much more durable than solid boards, It is also cheaper and has less environmental impact, due to the fact it uses less hard wood. Engineered wood is also suitable for use with underfloor heating and in the kitchen and bathroom. Solid hardwood flooring is still used in commercial projects with high pedestrian traffic. All wood used in flooring is graded by the manufacturers according to its appearance. The features which are taken into consideration when grading is the number and size of the knots present, the amount of sap in the wood and the colour variation. As a general guide, the smaller the knots, the lower the sap content and the more uniform the colour, the higher the grade of the wood. Choosing a grade ultimately comes down to personal choice. In recent years lower grade wood has become more desirable due to its natural characteristics which in the past would have been considered defects are now highlighted to make them stand out. This layer is the upper most layer in engineered boards and varies in thickness from 5 to 12mm. Its made from solid wood and gives the boards their character. As it's the top most layer, it does gradually get worn away over many years. The wear layer can also be deliberately removed by re-sanding and re-finishing your floor to give the floor a brand new look. Typically the thicker the layer, the more often it can be sanded down over its life time. For example, a board with an 8mm wear layer can be re-sanding and re-finished up to seven times. The width and breadth, along with the arrangement of the board has a massive impact on how the floor will look in the room. The size of the boards ranges from the traditional small solid wood parquet block flooring, to the modern wider engineered floors which are becoming more popular. We can help you choose the right board to give your house an open and spacious feeling. Ageing or distressing is a way to give a brand new board a huge amount of character whilst retaining modern standards of manufacturing and enabling, for example, underfloor heating. There are several different techniques that can be used to achieve this look. From tumbling blocks in a machine to using reclaimed railway sleepers, or even using wood from 400 year old French Chateaus. Our manufacturing processes mean that we can produce a bespoke board with the exact aged process that you require. This relates to the final layer, usually varnish or oil that is applied to the boards. Floor boards were traditionally finished after the installation, and we still use this process when re-sanding a floor. The boards that we use come with a finish coat already applied, this reduces the installation time and reduces the mess at that time of installation. We also have boards where the natural flaws of the material are highlighted through the finishing process, even some where the cracks and knots in the wood are filled in with a contrasting resin. We provide a bespoke service where you have complete control over the finish and the final look of the board to make sure you have something which you'll be proud of for many years.